So this might not be wild, or crazy…but it will hopefully help you know what to do when you find that $.99/lb (or less…if you are lucky) deal on chicken drumsticks, thighs or split chicken breasts. What’s your favorite recipe that calls for chicken drumsticks?! 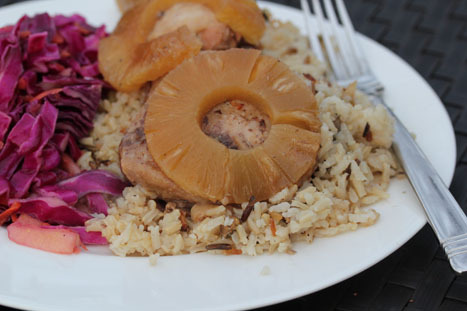 Our weekly dish is chicken adobo. I am Filipino with Greek thrown in so dinners were a variety of foods in my house growing up! But this is the easiest and tastiest for all 7 of us. This could be done on stove or crockpot. I choose crockpot. Combine all ingredients, cover and cook low 6-8 hours. This is a tangy dish and the smell in your house will be proof! Serve over rice and enjoy! I love to make oven-fried chicken when legs go on sale. I take the skin off, coat in flour, egg, and seasoned breadcrumbs, and bake for an hour. I make a huge batch and freeze most of them before baking for a very easy meal! Here’s an economical dish that’s a bit more elegant than a casserole, and the kids love it too! I found it on http://www.food.com. Mix together the flour, salt, and pepper. Coat the drum sticks with the seasoned flour. Melt the butter in a skillet with a lid. Brown the chicken over medium heat on all sides. Remove the chicken from the pan. In the same pan, combine the rest of the ingredients and bring to a boil. Reduce the heat, return the chicken to the pan, cover and simmer about 45 minutes. We like to serve this over hot boiled rice. Makes 8 servings. Recipe can easily be cut in half for smaller families. Here in Canada it is quite rare to find meat for less than $2 a pound (including ground beef and whole chickens). For some reason chicken legs are one of the cheapest meats to find, and go on sale for around $1.79 a pound so I’ve tried quite a few different recipes. Our favorites are the Oven-Fried Chicken Drumsticks (using crushed cornflakes and parmesan cheese for the outside coating and marinated in buttermilk and garlic), Ginger Maple Glazed Drumsticks and Tender and Crisp Chicken Legs with Sweet Tomatoes. The last one would be fantastic with tomatoes and basil from the garden. Funny, my daughter and I love drumsticks but the rest of the family doesn’t. So we usually stick with boneless but everyonce in awhile we buy the drumsticks, can’t beat the price! Thanks!